Members of A.D. Engineering and Collier Construction received the first Stay-On-Volume (SOV) Stormwater credits to put toward the up and coming Reside North community. 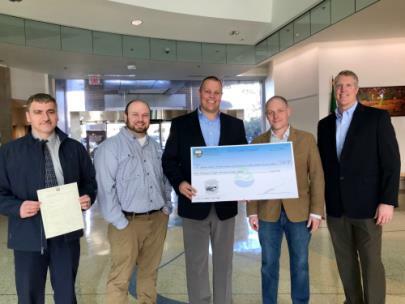 From left are Mo Minkara, Water Quality manager for the City of Chattanooga; Mike Hodges, Project Engineer for A.D. Engineering; Justin Holland, Head of Department of Public Works; Ethan Collier, president and CEO of Collier Construction; and Adam Driver, president of A.D. Engineering. Collier Construction teamed with A.D. Engineering to bring a unique stormwater infiltration process to the new Reside North community located in Chattanooga’s famed Hill City. The project features 12 new environmentally responsible homes with the majority of stormwater falling on the site being captured and infiltrated back into the ground, bypassing the City of Chattanooga’s storm system, according to Mike Hodges, project engineer with A.D. Engineering. As a result, the project is the first to receive stormwater coupons for Stay-On-Volume (SOV) credits, a new component of the City of Chattanooga’s stormwater program. Credit coupons are earned through the program in units of cubic feet of SOV and may be applied to other projects in the City of Chattanooga where infiltration may not be feasible or may be sold on the open market for other developments. 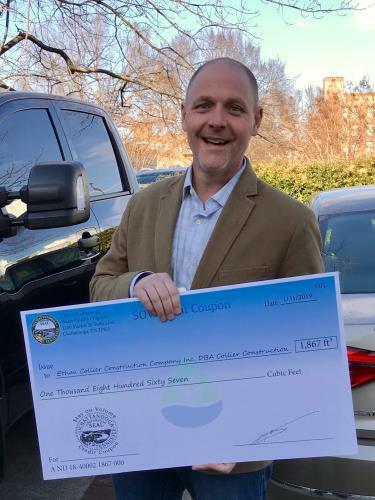 Ethan Collier, president and CEO of Collier Construction, receives a grand total of 1,867 cubic feet in Stay-On-Volume (SOV) Stormwater credits on his Reside North community.